Morgan Stanley and Facebook’s $38 Price: Did the underwriter misprice the IPO? It maximized benefit to the company, which is what an IPO should do. Photograph by Darren McCollester/Getty Images. The Facebook IPO: A boxing match in four rounds. Round 1: The price! Pegged at $38 by Morgan Stanley, the lead underwriter, the stock opened late for trading because the exchange malfunctioned, and then the price bobbed and weaved before slipping over the course of the week. Was this, as most said, a huge black eye for the underwriter Morgan Stanley? It shouldn’t be. Because what it reflects is that the company raised as much money as it could, instead of leaving money on the table for those lucky enough to have been given selective access to the initial offering. If a company sells 1,000 shares at $15, and they then jump to $20, the company raises and receives $15,000, but the initial purchasers immediately gain $5,000—an easy and unjustified windfall. If the IPO had been priced at $20, the company would have received $20,000—and there would be no windfall for the initial purchasers. The IPO in the second example is better for the company, because it raises more capital while selling the same number of shares. That is, of course, the purpose of the IPO. That is what Facebook did. Part of the reason underwriters love to see a stock “pop” is that they have used the opportunity to give access to the IPO shares as candy to their favored customers. This helps the underwriter curry favor, can make their favorite customers—often CEOs who can throw them business—even richer, but does not help the company. There has been massive corruption in the stock allocation process over the years, and the fact that Facebook’s stock dropped means that those favored customers didn’t get their unfair profits, which is an improvement on what usually happens. Round 1 goes to Morgan Stanley for doing a better job pricing than they are being given credit for, and to Facebook for maximizing its raise. Round 2: The selective disclosure! There are allegations that the underwriters told only certain favored clients about information regarding Facebook’s future declining earnings and about their belief that the company would not hit certain financial benchmarks included in the prospectus. If those allegations are true, small retail investors should never trust Wall Street again. Given all we have been through over the past decade, from the investigations of analysts back in 2002 to the crisis of 2008, this would be a breach of faith that would be totally without defense. If Morgan Stanley didn’t think Facebook was going to hit certain targets set out in the underwriting documents, they had an obligation to tell everybody. If the underwriting documents were wrong, you have to tell the entire marketplace not just the big guys who throw business to you. If they told only some clients, and let small investors trade on the false impression that the prospectus was accurate, then Morgan Stanley should be held civilly and perhaps criminally liable. The defenses I have heard proffered so far are about as persuasive as the ones they tried a decade ago: We are not as bad as the competition. They’re hinting that it is common practice to share information selectively. It may have been common practice years ago to trade on inside information, but that doesn’t make it sensible, legal, or moral. Round 3. The wedding! 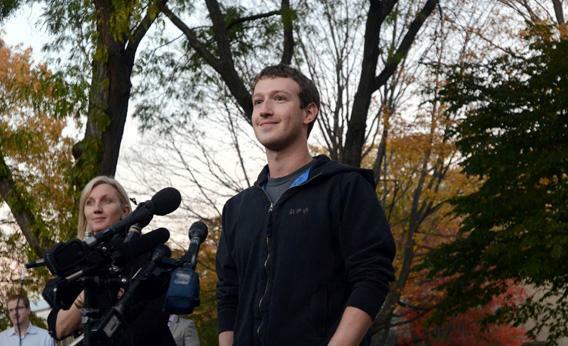 This round goes to Mark Zuckerberg in a clear decision: You got married. Congrats. You may have lost a few billion dollars between the IPO pricing and the end of your honeymoon, but hey: You own about 28 percent percent of the company—depending on how much you have actually sold in the past few days, still enough to pay for your kids’ college tuition. Plus, you are happily hitched: Enjoy what’s really important. Round 4. The revolution! This round is the one that matters most to the rest of the world. Whatever the pricing issues or the culpability of Morgan Stanley, the reality is that Facebook has spawned a revolution in social interaction that has transformed politics and life beyond, especially in nations where the ability of a repressive regime to control the media and virtually all communications had kept opposition voices quiet. The Arab Spring would not have been able to succeed without Facebook and Twitter. No government—no matter how despotic—can hope for much longer to control the spread of information, ideas, and opposition voices when the communication system is now horizontal, not vertical, when the people can bypass controlled nodes of government media to communicate freely. The Egyptian elections are messy, and we may not be seeing the candidates we would like to see at the top. Yet there would probably have been no elections and no spark in Tunisia and no removal of Qaddafi but for the media explosion led by Facebook. So whatever ugliness may have accompanied Facebook’s entry into the public markets, the arc of history and democracy are moving in the right direction because of the technology of Facebook. Morgan Stanley may be down for the count, Mark Zuckerberg and Facebook are winning in a TKO, and the world at large will triumph in a unanimous decision.